This story was updated at 4:26 p.m. EDT. A NASA spacecraft orbiting the huge asteroid Vesta suffered a glitch last week, but mission controllers say it will not affect plans for its upcoming trip to Ceres, the largest asteroid in the solar system. The malfunction on NASA's Dawn spacecraft occurred during a maneuver on Aug. 8, when one of the probe's reaction wheels that is used to maintain its position in space unexpectedly shut down. Mission controllers discovered the problem during a routine communications dispatch the following day, on Aug. 9, said Marc Rayman, chief engineer and mission director of the Dawn mission. "The wheel was operating normally, and then the internal friction increased enough that the software that we call 'fault protection' — it's a system software that looks at parameters on the spacecraft and monitors the performance of the different components — detected something unusual," Rayman told SPACE.com. "If something isn't within the limits we've specified, it takes action. In this case, when the friction got up to a certain level, it turned that wheel off." At the time, Dawn was preparing for its departure from Vesta, after spending more than a year studying the asteroid. The spacecraft completed its science objectives at Vesta on July 24. Since then, Dawn has been using its ion thrusters to gradually spiral away from the space rock. "The ion propulsion system, while very efficient, is also very gentle," Rayman explained. "It only gradually climbs away from Vesta, spiraling in ever larger loops until the spacecraft is going fast enough and is far away enough from Vesta that Vesta can no longer hold it in its gravitational grip." Rayman and his colleagues do not yet know what caused the malfunction, but Dawn is designed to fly to Ceres without using any of its four reaction wheels. Mission controllers intend to study the glitch in more detail during the spacecraft's interplanetary journey, Rayman said. Even if the reaction wheel cannot be salvaged by the time Dawn reaches Ceres in 2015, the spacecraft will still be able to collect data and make observations. After a different reaction wheel failed in June 2010, Dawn's mission controllers created a software update that enables the spacecraft to operate using only two of its wheels. "When we had problems with one in 2010, we immediately began work on software that would allow us to use two wheels instead of three, plus hydrazine jets," Rayman said. "We installed that in the spacecraft in April of last year. As it turns out, we had spectacular success at Vesta without any further reaction wheel problems, but we already have that software onboard the spacecraft. We will be prepared to use it at Ceres." Mission planners expect to resume firing Dawn's ion propulsion system on Friday (Aug. 17), and Dawn will once again prepare to depart Vesta on its journey to Ceres. "To make up some of the time, most of the bonus departing observations will not be conducted," NASA officials said in a mission status update. According to the most recent post, Dawn is currently orbiting at an altitude of more than 1,300 miles (2,100 kilometers). 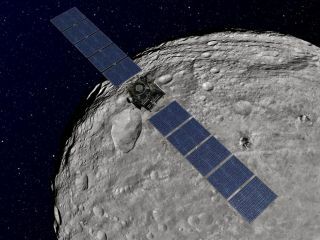 The $466 million Dawn spacecraft was launched in September 2007 and arrived at Vesta in July 2011. The spacecraft spent more than a year circling the asteroid, collecting science observations and snapping incredible photos of the massive space rock. Ceres, which is as wide as Texas, is the largest space rock in the asteroid belt. In fact, Ceres is so large it is classified as a dwarf planet. Dawn is expected to arrive at Ceres in February 2015, but mission scientists are already excited about what the probe may uncover once it arrives. "No spacecraft has gone to the vicinity of the dwarf planet Ceres, so we're very excited about it," Rayman said. "To me, the real story here is how cool it is that we're exploring what, in my view, are some of the last uncharted worlds in the inner solar system. Most people think of asteroids as chips of rock, but these are whole new worlds."